I have never been a Mince Pie fanatic and that is true still to this day. However come Christmas comes the madness of food shortages especially when it comes to Mince Pies a staple to any Christmas meal. SO on the road to Christmas I have sampled and recorded my thoughts on all the mince pies I devoured. 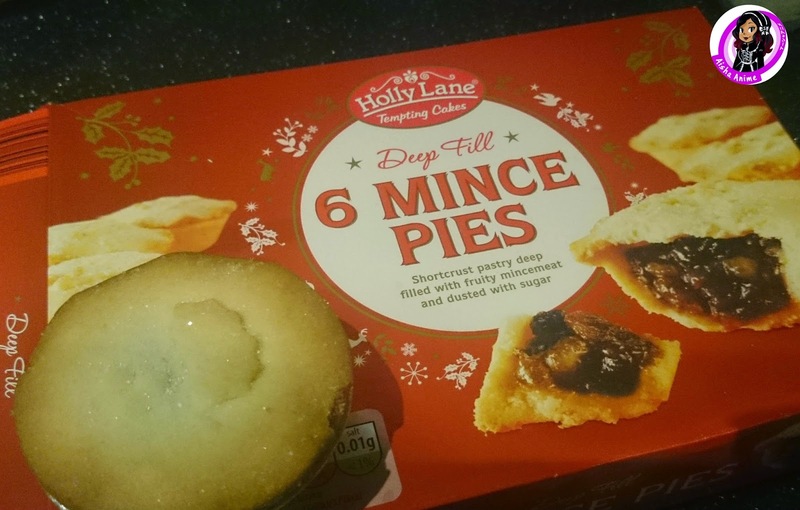 The box had 12 mini mince pies for the price of just £1.89 with the lowest calorie count of 192 calories, 17g of sugar and 7.6g of fat per pie. But I normally eat two because of the size. Small but nicely presented with cute holly pattern on top with light sugar dusting on top and brown edge. With a rich shortcrust smell as soon as you open the box. One bite into this pastry and you’ll be asking for more! I was so impressed with the mince meat texture. The pastery was not too thick or thin and had a great buttery ataste teamed with some double cream this makes my perfect dessert for xmas or not. The only fail was the size but great for dieting. Tesco’s own brand have always been hit and miss with me but lets see their standard for 2014. These seem to be no different to previous years. Same box art and nutrition of 255 calories, 19.8g of sugar and 9.4g of fat. As these pies are machine made, and looked a bit woky and two out of the box had mince seeping out. There is a great amount of sugar on top. The pie appears cooked evenly. Very crumbly and very sweet, I needed liquid to swallow. overall very indifferent about nthis pie. Didn’t hate or love and definitely underfilled. Overall tastes like a budget mince pie. More testing needs to be done before mass production Tesco. Rivaling Lidl will I get the same or a better result? The first thing you notice is that the box is much smaller than the usual mince pie box and it’s also not very Christmas themed. These have 236 calories, 22.1g of sugar and 8.3g of fat. No sugar on top and the pie in general looks ugly, bumpy brown texture, and as you try to remove it from foil and edges break off. Despite the ugly pastry, it tastes soft, ie stale which can be fixed if you put in the oven but I certainly don’t have time for that sort of nonsense. The box says there is lemon inside which I definately don’t taste but there is a hin tof apple inside. I preferred Lidl’s by miles but my mother liked this humble and overwhelming pie but she normally preferrs over sweetened things which this wasn’t also she drowned hers in double cream… The presentation let the pie down accompanied by a bog standard box with a lame product inside. I couldn’t not try test one of the most popular cake brands out theree available in most shops and only for £1 for 6 pies. The box boasts about having 100% natural flavours, no artificial colours and are all baked in Britain with 100% British wheat flour. At 253 calories and 9.2g of fat per pie, it is about average for a mince pie. Well, this was a sad pie, there was hardly any filling inside the festive box. There is a small amount of sugar sprinkled on top which didn’t help the chewy taste. The edges of the pie are well browned and broke off. The first bite was as expected, the pastry is crumbly but it stays intact. There is a buttery taste but that was lost in all the chewing to bit the pastry off which leads me believe it was undercooked I tried two pies from the same batch warm and cold and had the same disappointing result. Too crumbly on top, undercooked at the bottom with chewy insides. An exceedingly bad pie. This is my first time trying Sainsbury’s brand Mince Pies. This is another average pie at 259 calories and 9.5g of fat. These are “Butter enriched shortcrust pastry cases with a mincemeat filling”. The pastry is stated to be 52%, mincemeat at 47% and sugar at 1% which sounds like a nice even ratio. This looks nothing glamorous, a little brown around the edges and mistletoe diesign on pie. It looks like a solid, well filled mince pie. Now, this one is a nice mince pie. The buttery shortcrust pastry is lovely, and a good amount of moist filling helps this go down easily. The filling wasn’t too sweet which balanced out the sweetness in the pastry. Next time more thought on the look of the pie would help. The fresh bakery stuff is something you get tempted into by smell and sometimes special over this by no means was cheap £3 for 4. With no calorie or fat content you just dove in to the pie. It was flat and with a layer of icing sugar on top the plain supposed deep filled pies. Probably the driest mince pie of all. It disintegrated into my plate and their was no sweetness in the pastry crust or the filling for that matter. I have no idea what I bit into but I left this pie half way. My taste buds feel robbed.